Keystone Camera Outdoor Movie Party Ad 1958 This is a June 23, 1958 advertisement It is a nice color ad from Keystone Camera Co. of Boston. Ad shows a family having a outdoor movie party. Father is at the BBQ, mother is taking the movie, children are playing etc. Typical family and it reads, ""For a holiday at home, give a Keystone outdoor movie party."" In excellent condition. Photo is taken through plastic and may show wrinkles or crookedness that is not in the ad. This magazine tear sheet measures 10 1/4"" wide by 14"" tall. 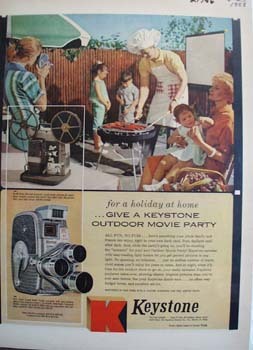 Items Similar To "Keystone Camera Outdoor Movie Party Ad 1958"